There was a time when reconnaissance meant either multi-million dollar satellites snapping a few shots per orbit or pilots risking their necks to fly over hostile territory. Today, recon is dominated by unmanned aerial vehicles (UAVs), a much more cost effective approach that presents no risk to the operators, who are not only on the ground but frequently on the other side of the globe. Of course, imagery is only useful if it’s crisp and clear, which requires both focusing and stabilization. That’s where Alticam Vision™ Corporation comes in. In 2001, Alticam Vision developed the first 700-gram gyro-feedback-stabilized sensor turret. 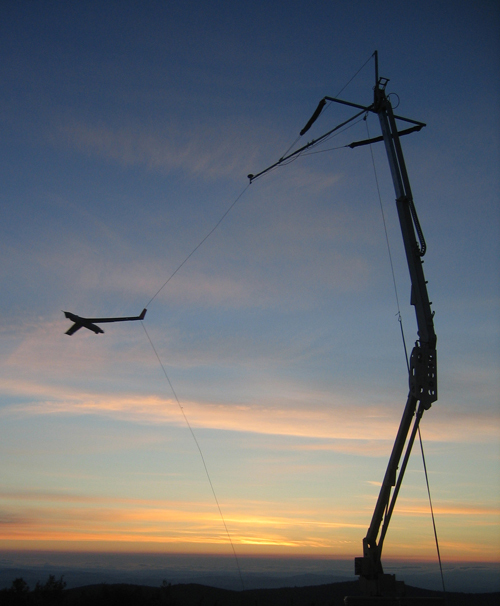 This enabled a new class of lightweight UAVs weighing 15 kg and offering 24 hrs of endurance. Central to the success of these systems is a collection of compact motors from MICROMO. Country: USA Challenge: Keep the turret, sensor, payload and electronics steady and aimed while countering vibration, thermal loading, wind forces and more. Results: A UAV that can take the heat of Afghanistan, withstand 35 Gs of force at take off and stabilize the sensor turret, to get clear images of the ground 14,000 ft below. Alticam Vision currently uses several classes of imagers: an Electro-Optical Daylight camera and a selection of Infrared (IR) cameras that image primarily in the mid wave and long wave IR spectral bands. The cameras produce NTSC video with fields of view on the order of 10 to 30 feet for a 1000 feet to 3000 feet altitude. Object-tracking feedback based on optical control loops allow the cameras to lock onto objects. For example, they can automatically track a truck driving along a road. Gyro-Stabilized Turrets Provide Real Time Imaging Lightweight, high-efficiency servomotors stabilize and position sensor turrets on unmanned aerial vehicles. An Alticam Vision turret keeps the sensor payload and electronics steady and aimed while countering vibration, thermal loading, wind forces and more. The 500-gram gyro-controlled gimbal mechanism consists of a coarse/fine design, with the outer coarse stage powered by MICROMO motors. The turret controls both coarse axes using micro- stepping stepper motors as rate actuators, closing the loop with an absolute encoder. Why not just use a torquer, you ask? Simple, says Dr. von Flotow. “With a stepper motor, when you command a step you get one, when you command a step rate, you get that velocity. When you command a torquer, you don’t get any motion until the torque you command overcomes the friction and then it jumps, so you have to do clever friction compensation. Most people think of steppers as doing a discrete number of steps but we step these things at tens of thousands of times per second.” At such rates, friction and striation are almost irrelevant and the motion becomes nearly smooth. “It’s basically then an angular velocity actuator,” Dr. von Flotow said. The motors are teamed with dual-path spur gearboxes to produce a 200:1 reduction ratio. That yields an angular velocity of up to 90 deg/s for the axis of rotation. The coarse stage features a large articulation, endless pan with slip rings to eliminate cable windup, and hence the need for unwind maneuvers. While the visible- wavelength imagers come equipped with motorized focus and zoom, the IR turrets also incorporate brushed DC motors from MICROMO for their focus mechanism. Some of the IR imagers also incorporate motorized zoom. 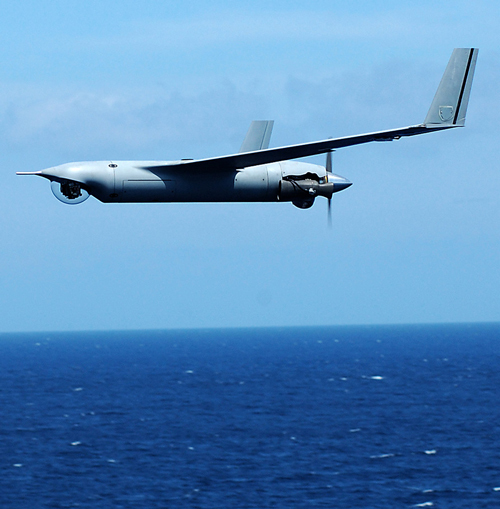 The stabilization and control specs would be difficult to meet on the ground, but UAVs impose additional challenges. One obvious constraint is weight, but power is also an important issue. Minimizing power consumption for the turret prolongs battery life, lengthening the vehicle’s range. The cameras draw about 3 watts, and the team worked to restrict the platform requirements to the minimum, in part by using high-efficiency motors. A typical stabilizing/pointing turret draws about 4 watts, so that the entire package demands only 7 watts from the aircraft. Since the propulsion system itself demands only a few hundred watts, 7 watts is a good number for camera-system power—a 200-watts camera payload would be about as unwelcome on these small aircraft as a 5-kg payload. Of course, even the lowest-power unit isn’t much good if it only operates in the lab. The theater of operations for UAV presents a relentlessly hostile environment. “They can get unbelievably dusty over there in Iraq or Afghanistan,” said Dr. von Flotow. “You should see some of the stuff that comes back.” It’s not just dust, either. 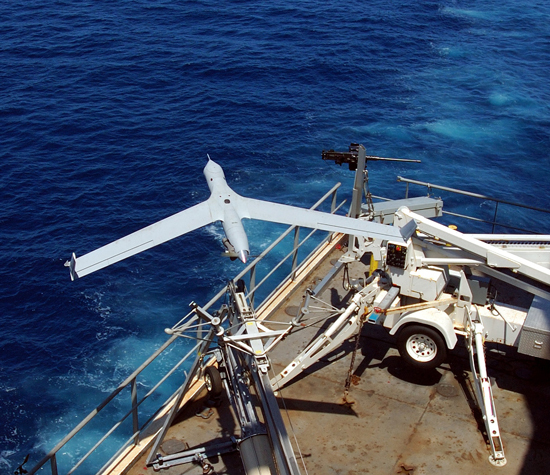 The U.S. Navy operates a number of the lightweight UAVs, and there the issue is less dust than the salt and humidity of sea conditions. Corrosion damage is rare, though, Dr. von Flotow says. A far bigger problem is temperature. “We have to watch for effects of thermal overload, first detectable in its effects upon the imagers,” he notes. “This has been an issue especially in high elevation, hot situations like Afghanistan in the heat of the summer.” The aircraft are often operated at 14,000 ft density altitude. The IR imagers require thermal stabilization, which adds weight and power demands to the system, putting more pressure on the stabilization motors to deliver motion in a small, efficient, economical package. For over 50 years, MICROMO (FAULHABER Group) has brought together the widest range of high quality, high performance linear and rotary motion solutions, decades of micro motion expertise based on dc motor technology and full service design, sourcing and manufacturing capability on a global basis to deliver benchmark motion solutions. Call MICROMO at 800-807-9166 and let one of our Application Engineers, design a custom motion solution for your next application.